Sorry in advance about poor quality photos – difficult with low lighting! I tried to get as many photos as I could. Note that some of these are nonvegan meals, as Mom dined along with me. Please note: These reviews are from 2011, and Disney has changed many of its products and allergy-friendly items. However, you’ll see in these reviews that our meals generally didn’t rely on many or any of them, so they should be relatively consistent. For my 2012 trip report, please click here. Jiko was a last minute reservation, about 10 days before we left for the trip. 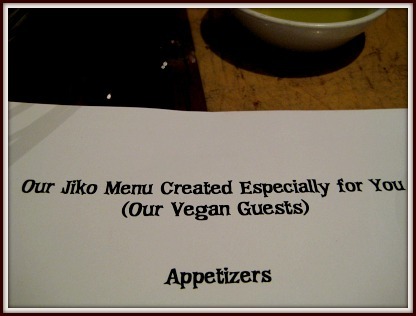 I was on the fence about Jiko for a long time, then read some positive reviews and was motivated by them having both a gluten-free menu and a vegan menu. A few things were on both menus so I knew I would be able to eat. Jiko is a signature restaurant and I’m pretty convinced it’s because of the huge wine selection. We didn’t have any wine, but we definitely ate our share of food. 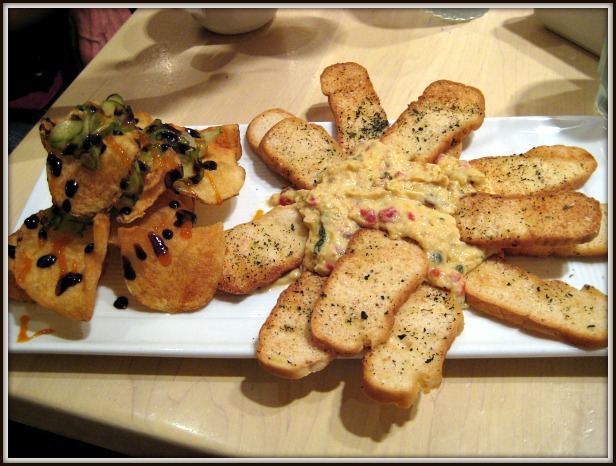 Because we had free dining, we didn’t hesitate to ever order appetizers if we wanted them. Jiko was our first stop at Disney – we had got there about 5 hours before, were exhausted, and I was pretty symptomatic. But we were still excited and looking forward to a good meal. I was pretty nervous because although I didn’t want to get sick at all over the trip, I especially didn’t want to get sick before my race on Sunday. We wheeled in and they offered my mom a seat and took the wheelchair to the side. It’s beautiful, and very clean in there, but it was FREEZING. We had brought sweaters but it was so, so chilly. When we sat down to order our waitress was polite, and we asked to speak to the chef. It took him awhile to come out, but it was very busy so it didn’t really phase us. We were starved, though, having just been a really long day. We soon also discovered that, no, he had no knowledge of our allergy sheets. Chef David was a little newish, I think, as he wasn’t sure on a lot of the ingredients and had to keep checking. A few things he said were safe we had to correct him, and they brought out bread that we couldn’t have. That being said, the best thing happened here. After we ordered (which I’ll get to in a moment), Chef David asked if this was our first day. We said it was, and he offered to contact all of the other chefs of the restaurants we had reservations at, let them know we were coming, give them our room phone number and my email address, and have them contact us. So we decided to start with the Taste of Africa, an appetizer that, for us, came with pappadum, Ener-G rolls, and four different dips: a chemolata, roasted curry, spinach/lentil, and olive hummus. I love pappadum so I scarfed that down while Mom feasted on Ener-G rolls (she couldn’t have the lentil flour). There was a bit of a red light when they came over with the gluten-filled bread for these, too, but he remembered just before he put it down. There was only one entree that was automatically gluten-free and vegan, which was the Roasted Winter Vegetables with Coconut Basmati and Durban Curry Sauce. 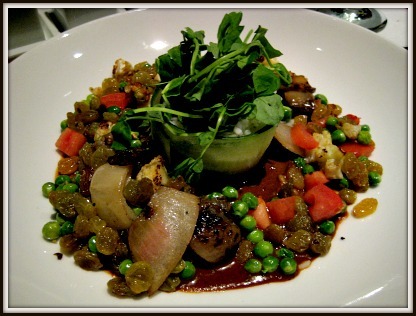 It had cauliflower, tomato, sultanas, peas, and onions (decidedly NOT winter vegetables), and was tasty. The rice was a little bland, though. The unfortunately part of this was (a) it was missing protein and (b) was a really small portion and (c) was SO spicy it made it almost unpleasant. I enjoy spice, but it was the kind of spice that was just a tad too intense. Mom had the Oak Grilled Filet Mignon with Roasted Fingerlings and Red Wine Reduction. They didn’t have to do much (or anything) to keep it free of her allergens. She said it was amazing. They didn’t have any safe desserts for either of us other than sorbet with some mixed fruit, which was good but neither of us are big sorbet fans. It was a good way to start the vacation, though, and Chef David did us a huge service. The phone was ringing off the hook the next morning. The next day I headed to the Expo with Mom to pick up my race kit. We didn’t want to go to a park after and decided to head to Downtown Disney. So we headed there, were seated, and the manager came out to speak to us. After learning that we had a multitude of food issues, he sent out the chef. Chef Fleming was super friendly and went through the menu with us. Since it was lunch and I was worried about getting sick the day before my race, I told him just to suggest something. He recommended the Heritage Tomato Salad, saying it was one of his favourites. 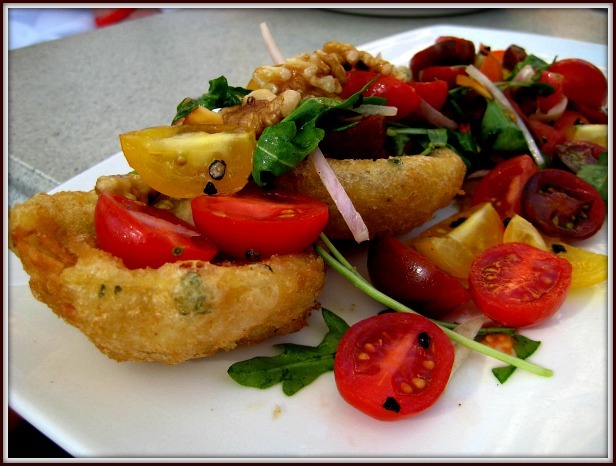 It had heirloom tomatoes, aruglua/rocket, shallots, lemon oil, and he fried me up some tofu, which was awesome of him. He also loaded it with caramelized pecans, just for something extra. 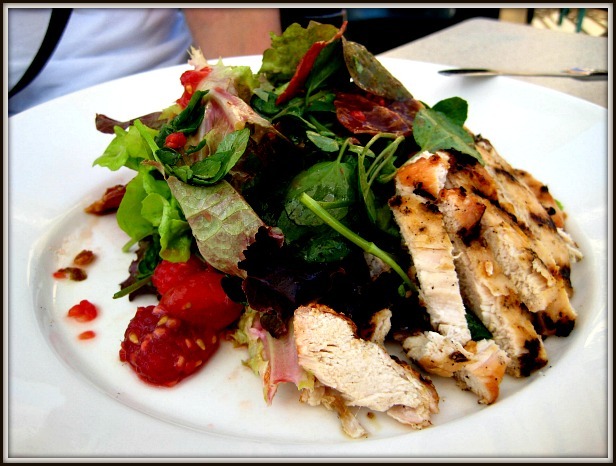 Mom ordered the Cashel Castle salad, which was caramelized pecans, grape tomatoes, raspberries, prosciutto crisps, and grilled chicken with a raspberry vinaigrette. But that isn’t the good part. He said, “can I get you anything else?” Jokingly I said, “no chance the onion rings are gluten-free, are they?” (Note: one of my past favourite foods that I ate infrequently and wish I indulged more now that I realize I could never really have them again). Although I wanted to high five him with happiness, I kept my composure, smiled, and ordered a batch. Our food was delicious here and Chef Fleming was great. 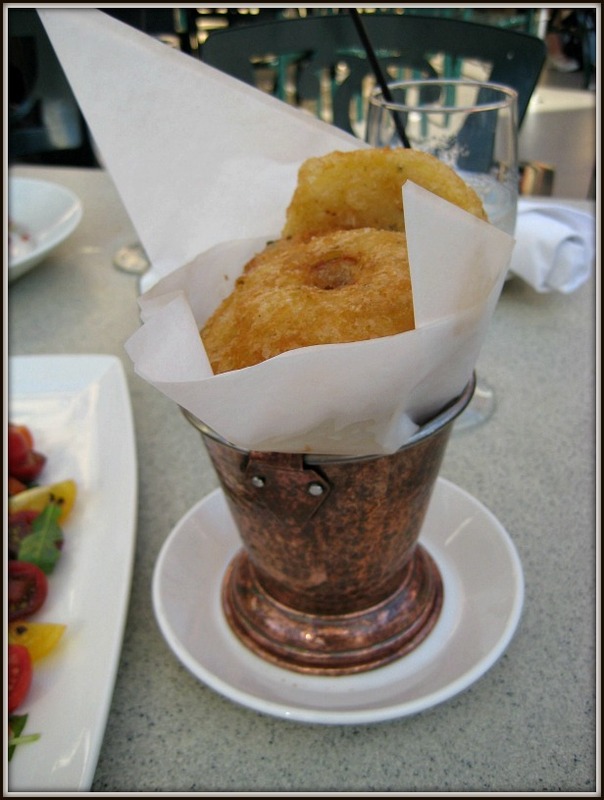 The onion rings were delicious, though, they tasted like tempura because of the rice flour — not a bad thing, though. Important lesson learned on my first full day of Disney: it never will hurt to ask. I had a plan in booking at Boatwright’s: it was at our resort so I figured I would be safest because I would have spoken to the chef, I’d be close by to head to bed early before the race, and, looking at the menu, I figured it would be a simple pasta dish which would probably be safe, mild, and okay – but tasty, too. Oh, Boatwright’s. What a disappointment. It was difficult right off the bat because, out of all of the restaurants that Chef David contacted, Boatwright’s didn’t get the message. Our waitress was, unfortunately, the most bitter woman in the world. Mom and I are pretty relaxed, friendly ladies. We aren’t picky and never trying to make anything difficult. That being said, Waitress was pretty annoyed when I asked to speak to the chef. We were waiting (for awhile) for him to come, and Waitress came back to see if we wanted anything to drink. Usually we’re water drinkers and, because drinks were included, we sometimes would get Pellegrino or Perrier. We decided to be a little more “adventurous” and get a virgin cocktail. We ordered a Tropical Ginger Lemonade, mostly because it has grenadine which I love (though I never want to know what garbage is actually in it). When she (finally) came back with our drinks, I asked her (to double check), “I ordered these virgin, right?” Waitress rolled her eyes(! ), and said, “yes, of course.” I’m… sorry to bother you? Sigh. The chef finally came out and told me that he could make the jambalaya and pasta gluten-free. He asked what I preferred then said, “I do make a really good veggie jambalaya.” I like when chef’s like to make things so I said, sure! I asked if there was any protein sources (tofu, et cetera), and he said, “no, but I have green beans.” (Haha… thanks?) Mom ordered Prime Rib with Yukon Gold potatoes. When our food came out, the portions were pretty generous. Mom commented her prime rib was good, but really nothing special: just good. I quickly decided I don’t like jambalaya. I’m not sure if it was his or just the dish in general (I’d never had it before), but it wasn’t that good. I’m not the biggest fan of tomato-based sauces on rice. Especially loads of rice with not a lot of vegetables and no protein. We didn’t get dessert (I am not sure but can assume it was just sorbet). On a side note, the next day I ate the leftover jambalaya and it was actually really good (I had reheated it). I think it was just a flavor thing, plus the rice was a nicer texture the next day (which is rare). Both from an allergy standpoint, taste standpoint… and service standpoint, I’d say: don’t go here. One of my favourite things about dining with Mom is exposing her to foods and cuisines she hasn’t tried before. A few years ago we travelled to Ottawa together and had really, really good and (dare I venture) authentic Indian food made by an elderly Indian woman in a restaurant that her son owns (they were dynamite for gluten-free). So, I was glad when I could show her that Mexican food is not, indeed, Taco Bell. On the day of the race, I hadn’t booked a dining reservation because I had no idea how I was going to feel. But it turns out, when you run a race slowly because you’re trying to hold your camera and take pictures along the way, you don’t really have to recover in the same way as if you’re trying to beat an old time. So when I got back, after our waffle breakfast, we headed to Epcot. I figured there was a relatively good chance I could find something to eat at Epcot, and around dinner time we decided to check out La Hacienda de San Angel. I had already written down that they were accommodating from the gluten-free sheet that Disney had emailed me, and figured that I would minimally be able to have guacamole, corn tortillas (those were 100% corn according to the sheet), and some veggies. It was an early dinner for us, and around 5pm we walked up to the front and asked if there were any openings that night. He said, “right now, if you’d like, since there are just the two of you.” Great! We headed in and they seated us in an awkward spot for the wheelchair. They had to move tables (and people) briefly out of the way, which Mom hates doing (as would anyone in a chair, I’m sure). We got to our seat and they said that they park all of the wheelchairs outside. Being our first time in the parks, we didn’t realize this was common practice with wheelchairs and strollers, so it made Mom a little nervous about losing her brand new chair, and we had to take all our valuables stored in the pouches. The server came over and there was definitely a language barrier. A lot of smiling and nodding and some knowledge, but finally he just got the chef, which made it a lot easier! They offer tortilla chips and homemade salsa to start but the tortillas have soy, so I asked them to take them away. I don’t LOVE tortillas and, either way, didn’t think it was fair to eat them in front of mom. Mom could order easily off of the menu. Other than the chips, because everything is fresh, nothing contains soy, and it was very easily gluten, egg, and legume free. The only legumes are directly (as opposed to sneakily) in the form of beans. For dairy, it was just a matter of saying no to the cheese. Mom ended up getting the Tacos de Camarones, which was fried shrimp with a chipotle-lime aioli, cabbage, lime and salsa verde with corn tortillas. Like usual, it came with rice and beans, though she forewent the beans. I enjoyed corn tortillas with loads of veggies, including cactus, bell peppers and zucchini. The rice and beans were, unfortunately, no gos… both of them were made with meat as the base. Again, no protein, but he did end up making me a side of green beans to round it out, and said I could have as many tortillas as I wanted. I think I had about 50. Refuel after the race, right? Overall, very good. We are planning on going here again. The only “downfall” was the lack of protein option for vegans. At this point, on day three, I was wondering if I was going to have a huge protein depletion by the end. Just kidding. But I did want some tofu! Knowing that buffets were going to be very good with food allergies, I was looking for Boma. This was my big “post-race” meal, even though it was the next day. I’m glad, too, because I never am hungry the day of a long run compared to the day after. Then, watch out, I’ll eat everything in site (unless it has gluten, animal products, or pineapple). We had a late reservation (10:45) because we (a) wanted to take our time getting there and (b) wanted to, with allergies, head there when it was a little more kid-free. 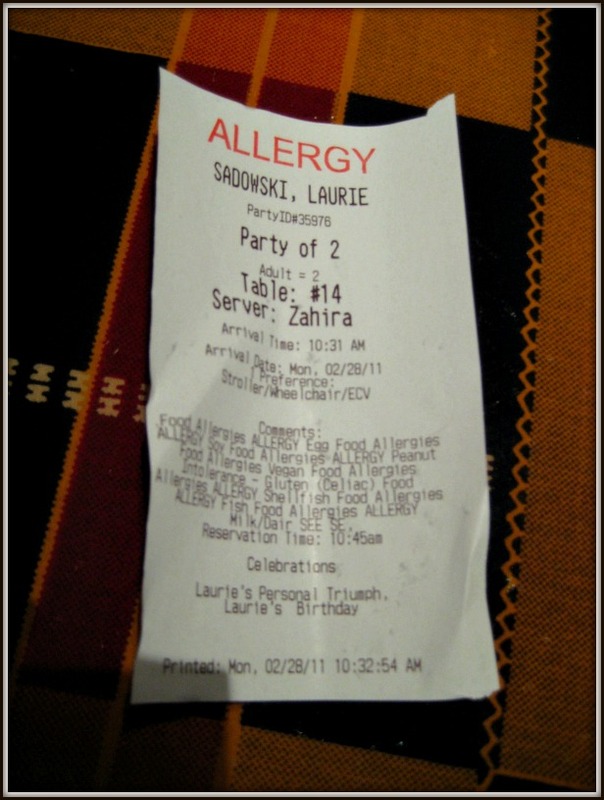 Because this was the first restaurant that accurately had our allergies noted (thanks to Chef David), our reservation slip noted them all in detail. After Chef David had called everyone, we had a call on the Saturday morning from… one of the chef’s at Animal Kingdom (I didn’t write her name, and this was about 7 months ago by time I write this), who talked to me about the breakfast and dinner options, and who the chefs would be and what we like and dislike. She was extremely nice and basically said that they’ll make anything for us and make sure it was safe. Needless to say, we were excited! When we got there, the server got Chef Amber, who was very nice, though seemed a little… tired. She took me around the buffet and noted what was safe automatically, and stuff she could change up so we could eat it. Everything, she said, would be taken from the back and brought to our table so we wouldn’t have to worry about cross contamination. Perfect. I told her we would try everything that was safe. She also asked if we wanted some Mickey waffles, which I agreed to only if they had Pacific Rice Milk (which they did). Soon they brought out a huge platter of fresh fruit, including watermelon, pineapple, grapes, strawberries. I don’t really love watermelon, pineapple is the only food in the world I absolutely hate, and grape are too high in sulphites for me, but the strawberries were perfect (I knew that the waffles wouldn’t have the real maple syrup I yearned for so the strawberries would be a good topper). Out came the waffles next, along with amazing potatoes. I never usually go for potatoes, but there is something about hash browns and breakfast potatoes that always look so delicious. I gave them a try and I can assure you: these were delicious! Another safe dish from the buffet was chakalaka, an African dish of spicy tomatoes and onions. Loved this, and although we couldn’t eat the actual things it was meant to go on, we ate it on everything else. There were also slow-grilled tomatoes. Chef Amber brought Mom out a heaping plate of fresh meat: turkey, bacon, ham, and sausage, all free of her allergens. She came back after bringing out the last thing and said, “you need some protein, don’t you?” I think my face lit up because she said, “I have some tofu in the back, what if I make you a tofu dish?” My mind flew to tofu scramble and I agreed. Soon she came out with a heaping plate of tofu with vegetables, chickpeas, peppers, tomatoes, eggplant, peas, and carrots. It was simple but delicious and the perfect candidate for the chakalaka. The meal was overall very good, and we ate loads. We are definitely coming back here again. A note about the waffles. We noticed here they were super crispy and nothing like the softer (but good) waffles that we had had before. Later we found out they use Namaste mixes here. I Googled them (to double check they were soy-free) and it turns out the main ingredient is sweet rice flour, which definitely gives them that crispness. I liked them but didn’t love them, and I think it’s because sweet rice flour has that distinct taste of mochi and tempura. They weren’t bad and I wouldn’t say don’t order them, but if you don’t really like sweet rice flour (which I don’t), then they’re not like any others we had in the park. Very delicious, and we’re looking forward to heading back here! 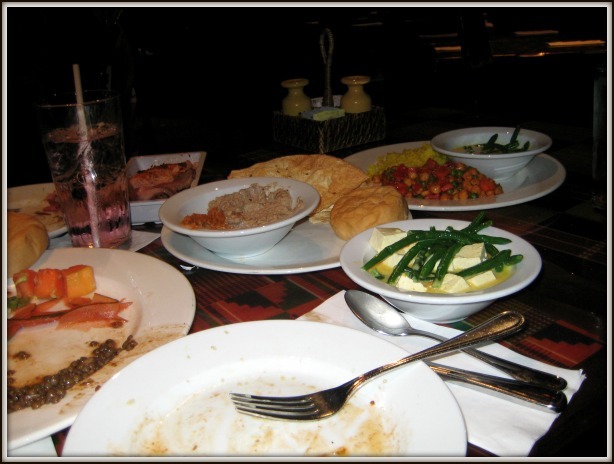 All of my reviews here are in order when we ate them except for this one; I grouped Boma together but actually, we ate at Boma at the end of our stay. They were already prepared for us, which was great, given our other trip to Boma and the phone call. I am not sure why but I didn’t write down our chef’s name. It was another woman and hopefully it will come to me! She was very helpful and really nice, too. 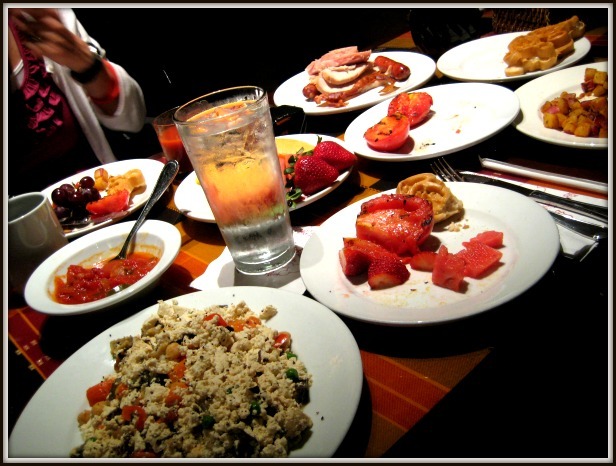 She followed the same format of bringing me through the buffet, pointing things out, then bringing it all to our table from the back, either fresh or revised and fresh. Similarly to breakfast, we opted to try everything we were allowed to have safely. There were a variety of hummuses and since we were at the end of our trip, Mom decided to give a few a try. Chef brought us out some warm Ener-G rolls and pappadum, but she deep fried the pappadum so I didn’t end up eating it (I only like it grilled… it gets really greasy and delicate when deep fried). She explained she didn’t grill it because it was where they grill the chicken. The two hummuses were sundried tomato and black olive, both of which were good, even though I’m not a huge olive fan. Salads included an apple/quinoa/spinach salad (which we also had before at 1900 Park Fare with Chef TJ… and I later learned that Chef TJ used to be at Boma so that might be why he was familiar with that dish), a watermelon rind salad (one of my favourites! ), a lentil and hearts of palm salad, and an avocado, grapefruit, and papaya salad. They were all very good and well made. Mom didn’t try the lentil salad to keep the legumes to a minimum. I loved the lentil salad and watermelon salad the most. Chef brought Mom out some striploin and salmon with harissa, both of which were good but with all of the other dishes, decidedly not as good as the meat and fish that she had before this (considering this was the end of our trip). The more African-centric dishes were her preference. Chef also brought me out a tofu with green bean coconut curry. She had to make it fresh because there was something in the original I couldn’t have. It was good, needed salt, and once there was salt, it was delicious. The standout here was Geery’s rice, which I could have easily eaten pounds of. We also got more chakalaka. Chef also recommended I try the Harira Soup (lentil-based), and I am so glad I did because it was awesome! The other dish we had was called Zaalouk, with lots of veggies, chickpea, and berbere spice. Out of breakfast and dinner, we enjoyed breakfast a little more, but I really liked the dinner. Some things were better than others, though, and I would hope that the menu will change a bit. I do notice that an updated menu shows some changes, but for gluten-free, vegan, and soy/legume/dairy/egg/gluten-free options it might be the same. Regardless, eat here! You’ll love it. I’ve never read a poor review of Boma. We cleverly made our California Grill reservation so we could check out the Magic Kingdom Wishes fireworks during our dinner. They stream the music through the restaurant, turn down the lights, and you can see it from the restaurant windows! It was pretty awesome and for that reason I’m pretty sure it is a two-credit restaurant. Our server was very nice and got Chef Brian right away. He had already spoken to me on the phone (thanks to Chef David at Jiko) so he already knew that we weren’t picky and we were okay for pretty much anything. He asked me if he could do a “special dinner” that they do for vegetarians and vegans, called a Vegan Unplugged. I agreed, since I’m open to anything. 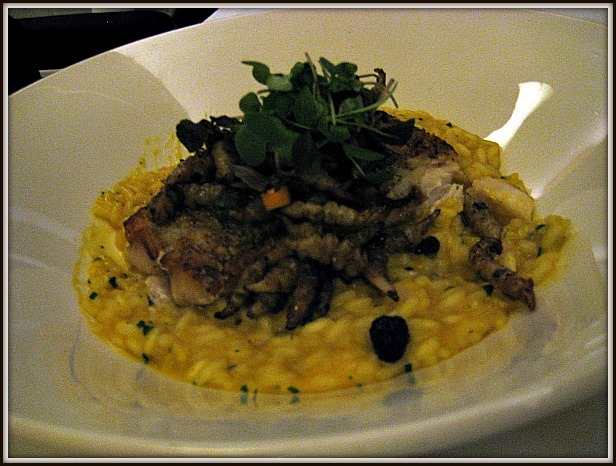 He was very good with Mom, who I encouraged to order something new, and she decided on a Golden Tilefish with Buttercup Squash Risotto, Caramelized Fennels, Crosnes, and Grilled Vegetables. We started with Ener-G rolls with olive oil, and they were heated nicely (compared to sometimes), which made them edible. We were starving and usually don’t like to nosh on the bread (especially when it isn’t very good) but needed to curb a bit of our appetite, otherwise, we’d be eating our dinner without breathing. Our meals came and my dish looked great! Chef Brian explained what was in segment of the dish: vegetable sushi, roasted heirloom beets with fennel, citrus, spiced pecans, and a beet vinaigrette on greens), the same risotto with crosnes, and some sauteed vegetables. Now, I’m a big eater, and I understand that in nicer restaurants the portions are smaller. I used to do restaurant reviews for two years and before I was diagnosed, I ate out at nice restaurants often. But this was a really skimpy dish. I think mostly because, you’d think at a nice restaurant that specialize in a “vegan unplugged”, they’d have some protein! The sushi came with three pieces, the salad was delicious. The vegetables were soaked in wheat-free tamari and limp. The risotto was amazing. Not at all a bad dish but I was glad I didn’t pay for it out of pocket (had Free Dining). 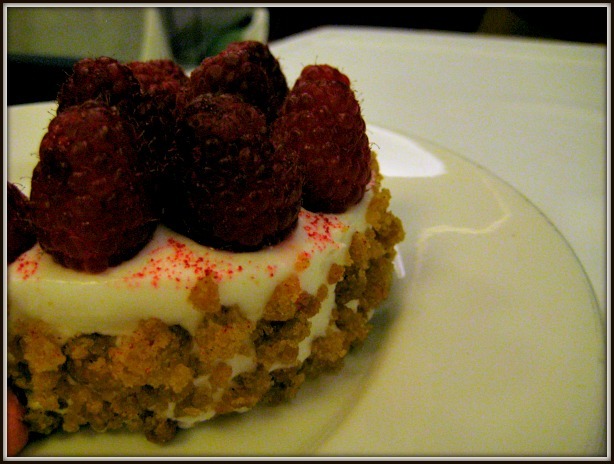 Dessert was nice – Chef Brian made Mom some sort of wonderful torte with raspberries. I will post up a picture soon and I was so jealous! I have no idea why I couldn’t eat it – and ever since that day I wish I had asked! Afterall, mom is gluten, dairy, egg-free, so the only thing I can think of is there might have been honey or gelatin. 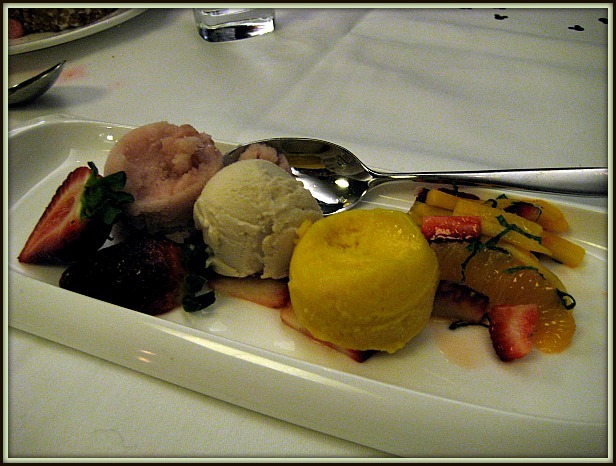 I had some macerated fruit with grapefruit sorbet, Rice Dream vanilla, and cantaloupe sorbet. Very good and interesting–better than just a basic sorbet. As I’ve said in another review, though, sorbet isn’t really my favourite. We definitely agreed that both of our meals were nice, though definitely NOT worth the California Grill pricetag, not even with Wishes attached to it. 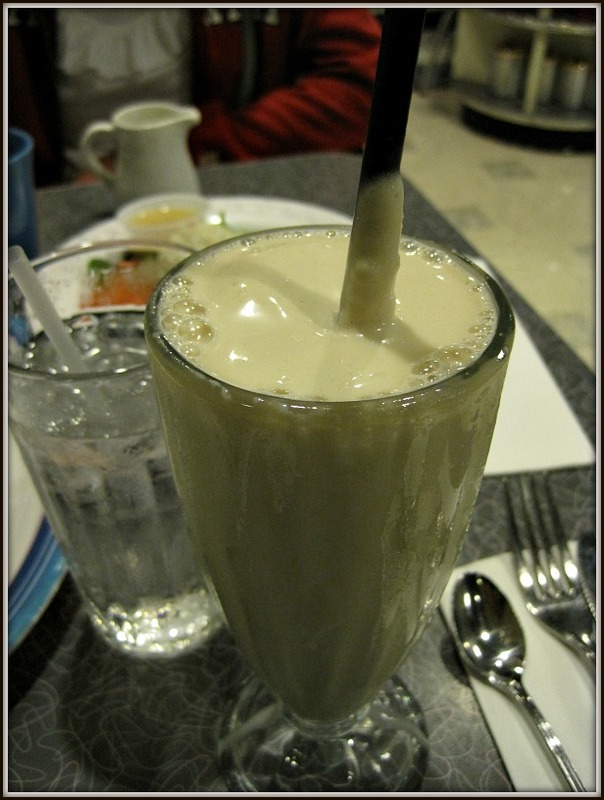 I booked 50s Prime Time Cafe for one reason and one reason alone: I heard I could get a vegan milkshake. I felt confident coming here because after Chef David had got all of the chefs to call me, someone did call me at 50s Prime Time Cafe. They explained they had a lot of options for both of us, and could bring in some special stuff to make a good vegan meal. Excellent. Even though the waitresses here are playing a role of brash and mind your manners, ours was super nice when she got the chef. I don’t recall his name, but he came out and was definitely not prepared for us. I asked him right away about the milkshake, made sure I could get it with Pacific Rice Milk and he said definitely. He asked if I wanted chocolate or vanilla and I asked how they make the chocolate. He said he used a syrup and went to the back to go get it to show me (which I thought was good!). He brought out a huge bucket-size of Hershey’s and after reading the ingredients I was pretty sure it was safe and, boy, did I want chocolate, but I couldn’t bring myself to (a) take the risk and (b) eat the crap that was in the syrup, anyway. There weren’t really any appetizer choices for me, and either way, I was going to have a milkshake. We needed a few more minutes and he said he would come back. Our waitress came back and made some recommendations, then told me that the vegan milkshakes were NOT good because they don’t get as thick. A few minutes later, the chef returned and I asked him. He said, “don’t worry about it. It will be very thick. I’ll just add more ice cream.” Fantastic! 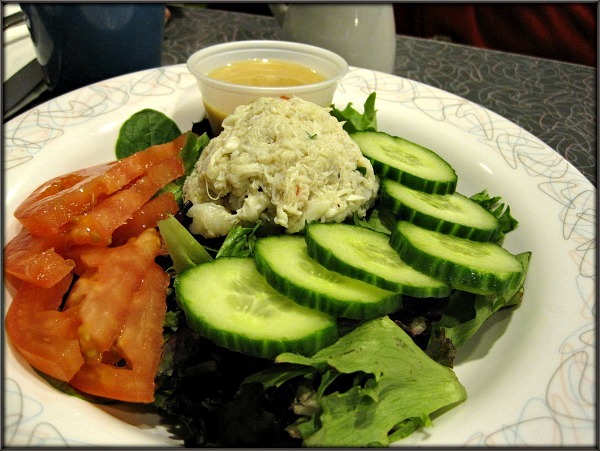 Mom ended up ordering a seafood salad to start: scallops, crab, shrimp on greens. We’re pretty sure this caused some symptoms. It might have been fake crab, which often contains gluten. It definitely didn’t help her, though, but it was something in this meal. For dinner, the chef had absolutely nothing to offer me. He was flustered, went to the back to check things, came back, went back again, trying to figure out some options. He asked Mom what she wanted and she suggested salmon, so he said that he could make a huge dish of pasta for me with “lots of veggies”, and put some on the side for mom’s salmon. We agreed that was fine. The pasta was tasty but I think it was about 1 cup of pasta with four pieces of fries zucchini in it, tossed in olive oil. I’m glad that my milkshake had 10 pounds of ice cream in it to fill me up. 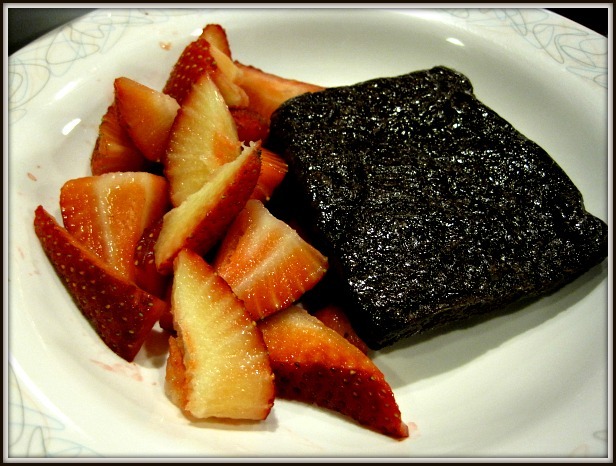 He said for dessert they had a Bob’s Red Mill brownie mix and we could have that a la mode with strawberries. I didn’t want more ice cream (well, I did, but decided I shouldn’t), and Mom couldn’t have either of the choices, so we had it with some strawberries. It was really good! Chewy and just sweet enough and a little gooey, though ice cold. The meal was not bad and the chef tried really hard. I am sure my mom had a speck of something, though. We’re also certain we won’t return, for lack of choices, but I will, indeed, order a milkshake at the bar next time we go. Right when we got to Sanaa Chef Majdy came to our table. And what a treat this was! He had already spoken with Chef David and had contacted me, and was excited to talk to us for our meal. He had so many recommendations we decided to order BIG here. He also told us some interesting things, especially on how rigorous the chef training at Disney is. Apparently, they have to go through detailed allergy training and pass tests at the end, and most of them fail, so they have to do it again, making sure they really understand the severity involved. He detailed this for us and it gave me more peace of mind dining in Disney in general. There is a vegan menu at Sanaa also, which definitely made it easy to order. I really wanted pappadum again so we got the Indian Style Bread Service which included pappadum for me and Ener-G for mom. You could choose from different dips and chutneys, and out of the ones we could have, we ended up ordering three chutneys: mango, mint, and coriander. All of which were delicious. We also started with a Tomato Spinach Soup, especially since Chef Majdy detailed the way they do the tomatoes: all of this blanching, soaking, seeding, leading up to the best part: cooking down for three days. We were sold and, yes, it tasted amazing, and fresh from the garden. 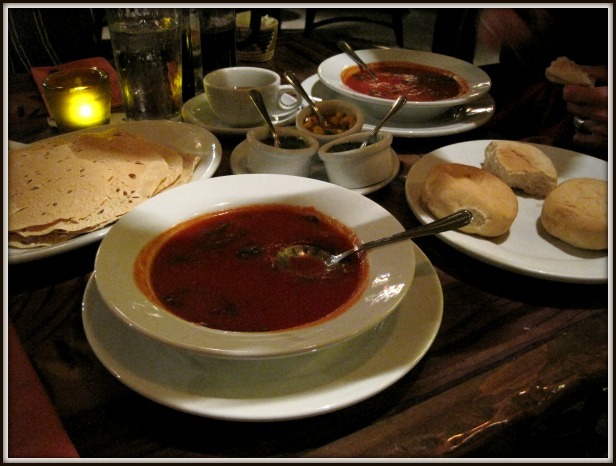 Although this isn’t always on the menu, it is available, he said, because it is the vegan version of a menu mainstay of tomato soup with paneer. 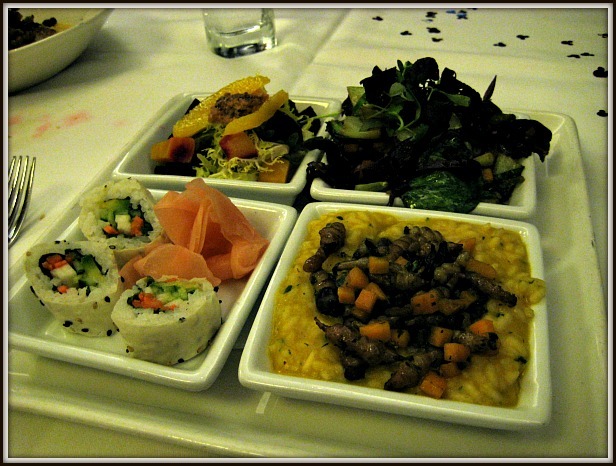 For our main dishes, I ordered the Sanaa Vegetarian Sampler. It could be served with a 5-grain pilaf or basmati rice, so my choice was limited to the basmati (which I probably would have got anyway). Not all of the choices were vegan, and the current menu has different ones. I had the chickpeas and vegetables with a green curry sauce, and spicy cauliflower with tomatoes, onion, and mint. 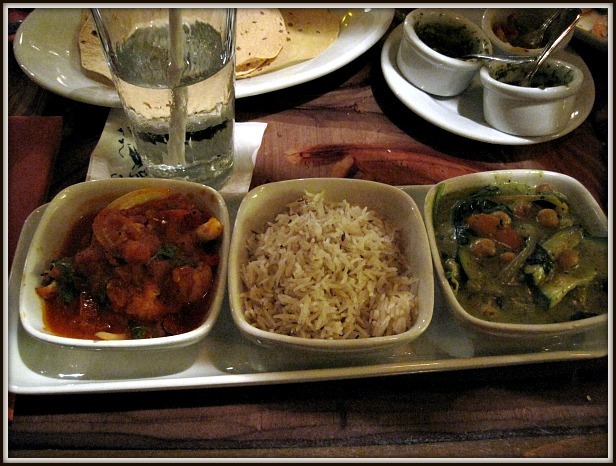 Very good – and a great mix of Indian and Thai. 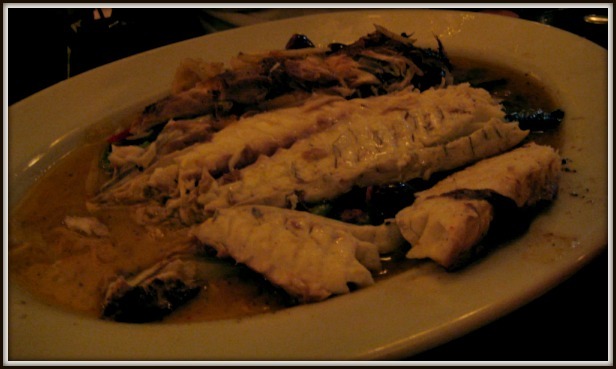 Mom ordered something still on the menu, titled as “Today’s Sustainable Fish”. It came with shrimp and scallops, vegetables, all in a curried broth. The fish was called dourade, something we weren’t familiar with. She said this was one of the best meals she’s ever had. We were stuffed for dessert and the option was, you guessed it, sorbet. We mentioned we were sort of sorbeted out, and we didn’t want to get it just because it was included. He said, “I promise I’ll make the sorbet something amazing.” We didn’t want to say no. 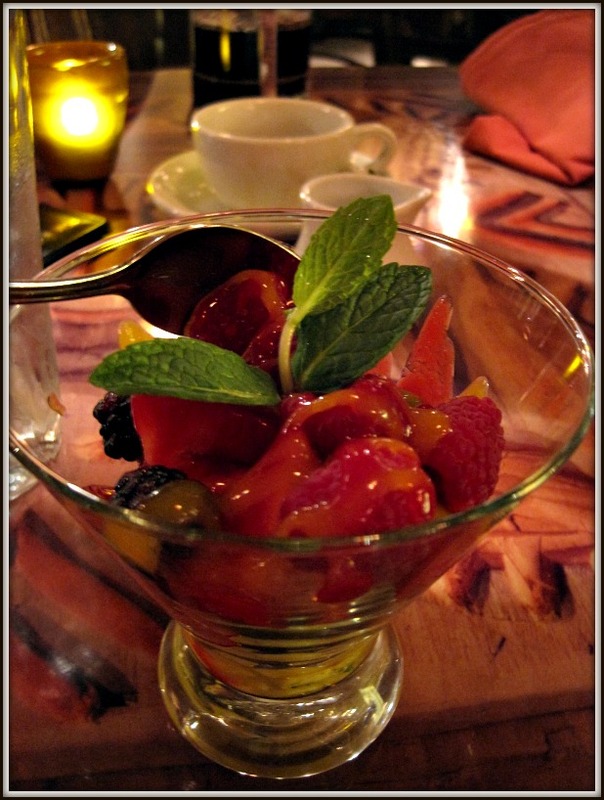 He served our sorbet with macerated peaches and mint, all with a raspberry sauce. He was right – it was better. On a side note, Sanaa (along with California Grill and Kouzzina) are a few of the only places that had real coffee – not that Nescafe garbage. I had to give up coffee last year, but it made my mom (who never drinks it for the MS diet) have a nice treat a few times. Eat at Sanaa! One of the best, by far. If you’ve done any research on eating vegan or with allergies at Disney, you’ll know that Chef TJ is a bit of an enigma, serving up elaborate multi-course meals for those with restrictions. Basically, you hunt him down and go to where he is. No. Matter. What. The fact that it happened to be at 1900 Park Fare was okay. It was such an “elegant” affair (even just being at this resort… very fancy). Loads of kids here, anxious to meet the Cinderella and the clan, while Mom and I were just here for the food. (Although it was sort of fun, too). Chef TJ came out right away, with some sort of excited energy that you definitely want to see in a chef. He explained that he had something like 23 allergies that night, and ours might take a little longer because “those are mostly kids”. I think with the kids they must keep it simple. We said no problem we had all night. In between, our server was super attentive. He asked what we wanted to drink and generally we chose Pellegrino, Perrier, or water. I decided on chocolate soymilk for a change, and he came out with a HUGE glass. I figured I’d get a small carton and he said, “those are way too small, so I opened up a bunch of them.” It was a LOT of chocolate soymilk. Thanks to Chef David, Chef TJ emailed me a few times with what we like and what we don’t, so he already had a pretty good idea. Our first course consisted of a plate of garlic toasted Ener-G rolls, that he had sliced thin and toasted until crunchy. There was a huge pile of roasted red pepper and caper hummus. Beside it lay homemade potato chips with pickled cucumbers, all drizzled with balsamic reduction. These were BOTH delicious. The nature of the rolls made them a bit crumbly but what a treat to have garlic bread instead. And the chips? I don’t even like chips and these were fabulous. We ate it up in no time. Our second course came out soon, and it was a trio on a plate. We had different ones because, Chef TJ explained, my dressing had wheat-free tamari and it also included edamame, both off-limits to Mom. 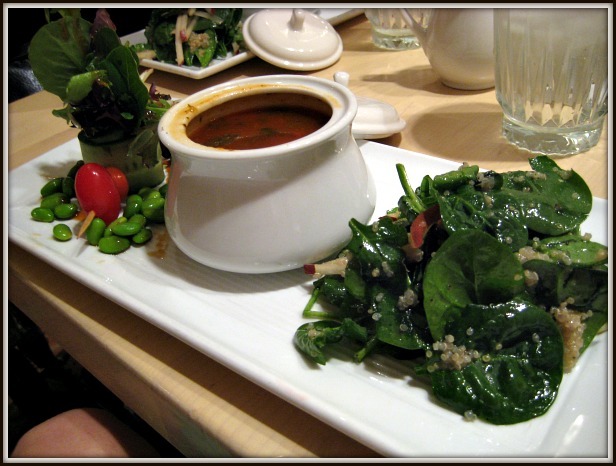 We had an amazing tomato vegetable soup, the quinoa/apple/spinach salad that we had at Boma for dinner, and mixed greens with cucumber, tomato, and edamame with a teryaki dressing. It was all so good. And we were getting full. Then the main course came out. 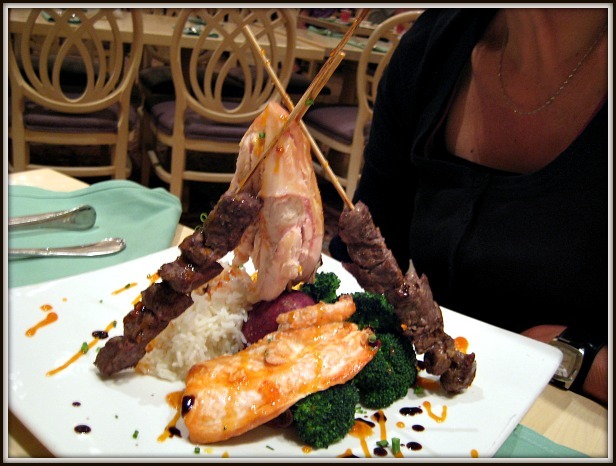 Mom’s main course consisted of a huge chicken breast, with a large piece of salmon on top and a bunch of beef skewers sticking out of it. There was a load of roasted potatoes and rice all around it, along with corn and broccoli. It was topped with a sweet garlic chili sauce. It was a mountain. As soon as he brought it out he said, “I forgot the shrimp!” Mom was about to stop him (there was a LOT of protein on that plate), and he rushed back to the kitchen and brought of a plate of shrimp. You know, in case it wasn’t enough. She really loved her dish, though said the beef was really dry. Not that she was complaining (at all), but it was in the cut of beef, not the cooking or preparation. Just a warning if you head here and want succulent beef. Now, Chef TJ sure knows how to treat a vegan! 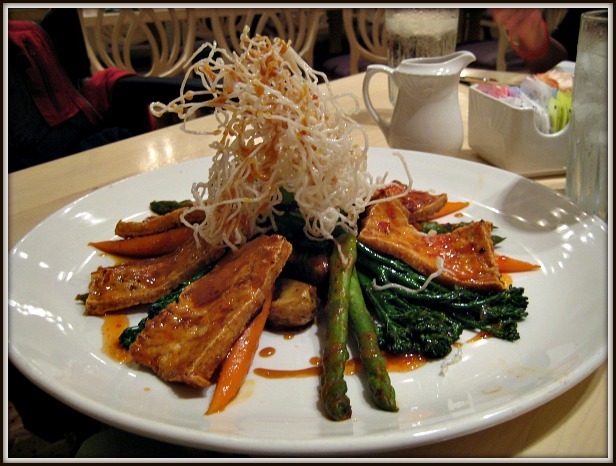 My dish included a super sweet teryaki sauce with perfectly marinated and fried tofu (must have been at least half a block), roasted fingerlings, Chinese broccoli, lots of mushrooms, and carrots. This was the first time I couldn’t finish a meal, especially because I knew dessert was coming. Next was dessert, another elaborate affair. 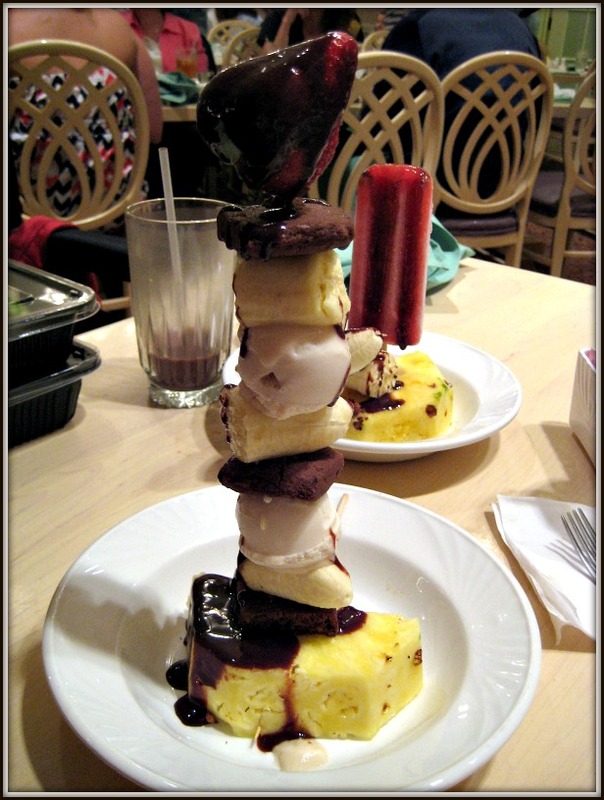 Chef TJ made a mountain/tower of ice cream and brownie (Curious George ones), using Rice Dream (the ice cream doesn’t use barley) and bananas. He came out and said, “may I?” then squeezed probably about 1/4 cup worth of chocolate sauce all over it. The brownie wasn’t good at all (don’t by these), but I couldn’t eat everything anyway. Plus, once it soaked up the ice cream, it was much better. 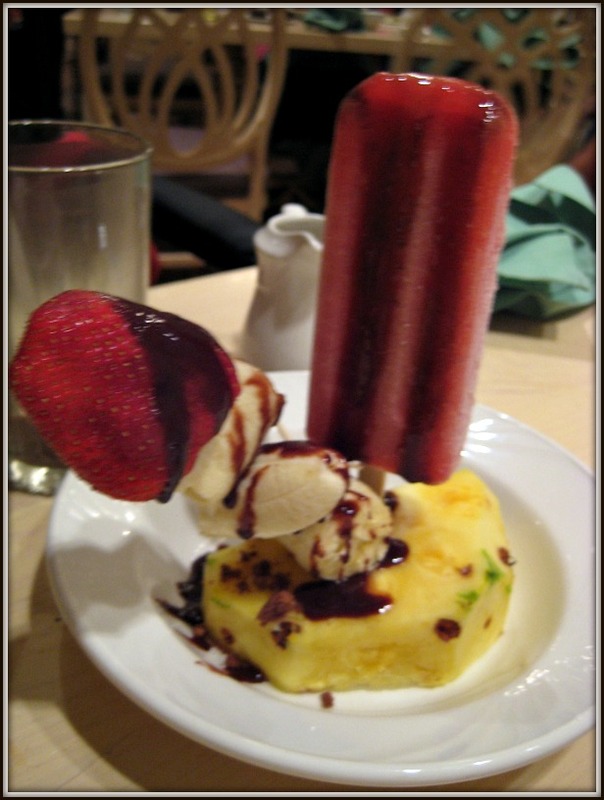 Mom couldn’t have this so he brought her out a raspberry strawberry fruit bar with banana and skewered into a pineapple. We ate most of our desserts, and he let us take the rest of our mains home (which we saved for the plane ride). Moral of this meal: find Chef TJ. Eat there. Currently, he is still at 1900 Park Fare. 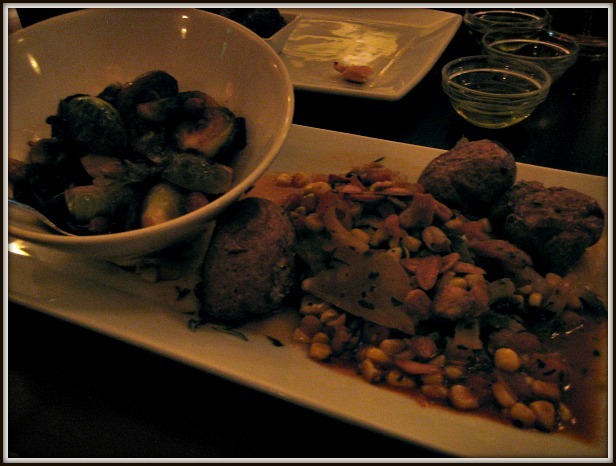 I had read a lot of good reviews about Kouzzina and had heard that Cat Cora had implemented vegan options to be easy there. Secretly I was hoping that she would be there cooking for me. She wasn’t. However, Chef Dee was and is ammmmaaazing! This was a huge standout for us. We started with some (perfectly warmed) Ener-G rolls with different Greek olive oils, which were really tasty. There was also some hummus and skordalia, a potato and garlic dip. She also brought us out some dolmades, which I have had only poorly made, and these were so delicious. A favourite. I could have eaten a huge platter of them for dinner. We had already chatted with her for awhile at this point, and when asked what we want for dinner, Mom asked for recommendations. Chef Dee said that they were known for their Traditional Whole Fish, so that is what Mom wanted to hear, and went with that! She said that they fly the fish out of Greece the day before, it arrives in less than 12 hours and (this part, vegans, is not ideal to hear), hasn’t hit rigor mortis yet. That is how fresh it is. Gross and inhumane to me, but if you’re going to eat fish, let’s hope it is fresh. It came with braised greens, Greek olives, fennel and smoke chili. Because it came out whole, someone came to the table and deboned it for her. Chef Dee told me she loves when vegans come in so she can get creative, and asked if she could do that for me. Of course! I would love anything and everything. Yes, Chef Dee really knew what she was doing. A huge plate came out with roasted Brussels sprouts with chickpeas, gigantes, smashed potatoes, and this AMAZING succotash with roasted garlic. I don’t even really love corn, but this… oh, baby, amazing! 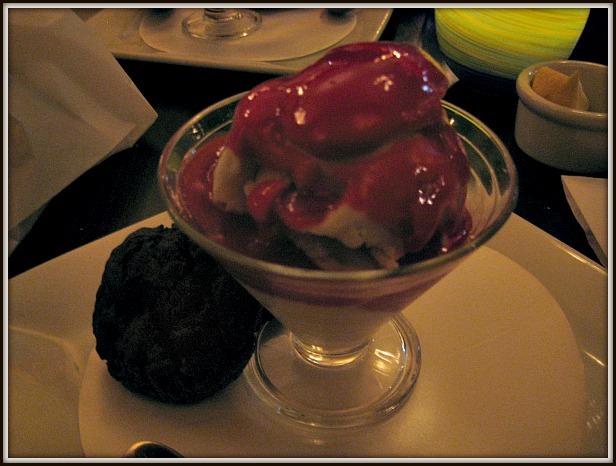 When it was time for dessert, we said we were stuffed – and mentioned that, if it was sorbet, thanks but no thanks. Chef Dee said that at Kouzzina they keep a supply of Gluten Free Kneads frozen cookie dough and she could bring us fresh from the oven double chocolate cookies. She then asked if I wanted a cookie sundae. How could I say no? The cookies were delicious – very chocolately and brownie-like, with that fresh baked warmth. She topped it with some vanilla Rice Cream and homemade strawberry sauce. Mom had the cookies with fresh berries on the side. We loved Kouzzina and it was definitely one of my favourite meals. Going to Tusker House as our last meal was a bit of a disappointment, both from a food and food allergy standpoint. Situated in Animal Kingdom, Tusker House looks nice, was super wheelchair accessible, and very quiet, since we had the last reservation of the night. The chef came over and, like always, brought me up to the buffet. I mentioned at Boma that they went in the back and brought everything fresh and he didn’t seem too familiar with that. But, really, that was the only way we would eat it. We went around the buffet and kept muttering, “gluten-free… vegan…” as if to remind himself. In the first row, he was pointing and indicating, and saying what he could make differently. So far, so good. So then I started to get a little nervous. How could this chef know his stuff? I realize that vegan and gluten-free combined might be difficult but, honestly, every other chef until this last day didn’t have an issue. And then we got to the third couscous dish. And he said it again. With all due respect to the chef at Tusker House. I was nervous. I realize that all of the couscous dishes were safe for vegans. But unlike something that has hidden gluten, like soy sauce, the actual main ingredient WAS gluten. We ended up getting everything that was safe to eat. Mom had a dish filled with beef tenderloin, salmon, and rotisserie chicken. We both had roasted potatoes, green beans, saffron root vegetables and cabbage, baked plantains, jollaf rice, and a variety of chutneys. I had some tandoori tofu. Everything was okay, food wise. It certainly wasn’t nearly as delicious as any of our other meals, though it did beat out Boatwright’s (not that it was difficult to). Unfortunately, I started feeling some of my symptoms right after the meal, and the next day had a small but annoying reaction. It was our last day, anyway, so I suppose it was for the best, but I wouldn’t necessarily say that the chef here really knows what he is doing. Given that the food is also subpar, I wouldn’t recommend Tusker House.